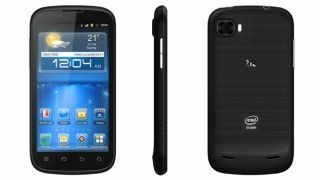 ZTE's new flagship handset is its first with Intel inside, with the ZTE Grand X IN rocking an Atom processor and Ice Cream Sandwich. If the name and look seem familiar, it's because the ZTE Grand X is barely out of short trousers; but crucially doesn't feature the Intel hardware (hence the IN suffix). The Intel Atom Z2460 chip with 1GB of RAM comes with a 4.3-inch QHD screen and 4GB of memory expandable to 32GB by way of microSD. It's going to allow for HSPA+ speeds of up to 21Mbps. The Grand X IN also has an 8MP camera with flash and 0.3MP front-facing snapper for video calling and unflattering, jowly self-portraits. Capable of recording and playing 1080p footage, the Grand X IN is also DLNA compatible and has an NFC chip for wireless data transfer and contactless payments. ZTE's new flagship handset will be coming to Europe this September, although there's no word on pricing or whether it'll get an upgrade to Jelly Bean yet either. The handset was launched over at IFA 2012, where we currently have our phone hounds sniffing out a sample, so stay tuned for the TechRadar's hands on ZTE Grand X IN review, coming soon.